A look at Manipur in North-East India. The phanek is like the sarong and was traditionally worn without a blouse, above the breast. 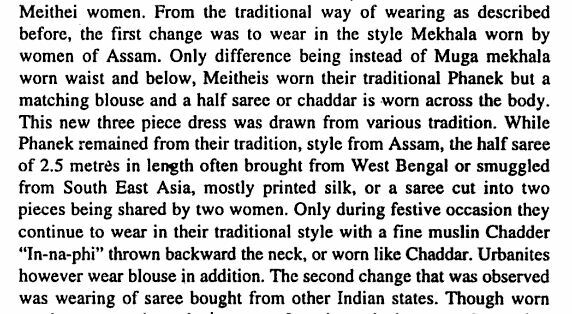 Eventually it was worn as a tubular skirt/sarong with the blouse and a piece of cloth draped across the upper part of the body, the changes resulting from Assamese and Bengali attire. Apart from the upper cloth, the attire is quite similar to that in many parts of South-East Asia. Note: Meiteis are the majority ethnic group in Manipur. This entry was posted in India, Sari Blouse, Vintage and tagged dress, East, india, Manipur, phanek, sarong, vintage. Bookmark the permalink.